Would your family like to live or weekend in this wonderfully inviting, log cabin lodge? Soak in the spa with fabulous views to the Observatories, High Point Lookout and the snow on San Jacinto! Thinking of a vacation rental? Oh my goodness! Who could resist sitting by the fire or relaxing in the sauna??? 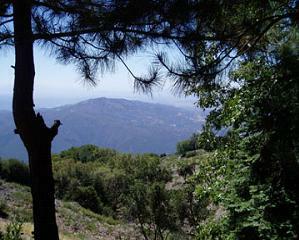 It would be a favorite destination on Palomar Mountain. 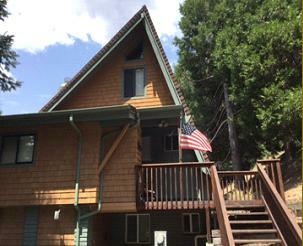 Nestled in the middle of nearly 8 acres, 2 bedrooms plus sleeping loft, 2 baths, 1672 square feet. Come away and live your dream with ultimate privacy and views! The peacocks moved on now, but the name has stayed for over 50 years. Ray and Hazel Kersh built their home in 1964. The seller's Aunt Hazel was known as the Bird Lady of Palomar. She raised exotic parrots, was world renowned for her cockatiels and everyone traveling the grade would marvel at the beautiful peacocks that would be out to greet us. More info real soon! Meanwhile, who would like the beauty of the four seasons (some snow, but no plow needed at 3500 feet elevation), a 1600 sf absolutely lovely, 2 bedroom, slump stone home with amazing built-ins, gorgeous, updated kitchen, large garage/workshop, storage rooms, patio room on 5.83 acres with your own well? Extremely level, ideal for animals, gardening, grandkids, RV, boat and all your toys. When the buyer just had to have the Little O'Chalet, this lot was part of the deal. It is offered as a separate purchase but can only be acquired with the cabin. So, both are in escrow. 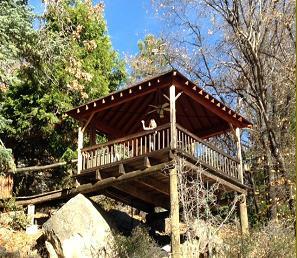 The charming gazebo looks out to the fabulous 575 acre Jeff Valley that is soon-to-be National Forest. Steel shed, RV or carport, and Birdville for all the local feathered friends! Spectacular ocean and sunset views from absolutely charming cabin. One of the most extensive remodels on the mountain w/receipts for $257,000! Big stone fireplace, rich woods and lots of high end, artistic touches with superb craftsmanship. The last few years we've watched this cabin bloom into a completely new kitchen with knotty alder cabinets, high-end stainless appliances, slate showers, two bedrooms plus a loft, huge walk-in cedar closet with the washer dryer there too--pretty smart! 1200 sf cabin on .89 acre plus separate lot of 1.1 acre next door with a pre-approval for a 3 bdrm cabin and a well with great water! We have a pest and septic certification and detailed property inspection waiting for you. Absolutely move in ready! Neighbor purchased prior to posting. Beautiful view with highest and best use of the property going to someone who owns adjoining land. Recorded survey showing property corners! Like to cozy up to a nice brick fireplace in the winter time? This cabin just may be perfect for you. 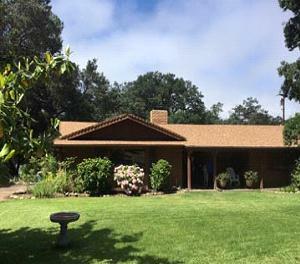 On a half acre, built in 1935, with 750 sf, the owner has done quite a bit recently with new insulation and interior wall, doors, new roof, 3 skylights, new kitchen plus added a loft! Oh, don't you worry, there are still projects to keep you busy. Move out those woodpeckers, maybe enclose the porch, add a deck at the back to enjoy the forest view. 2 bedrooms, loft for the kids. 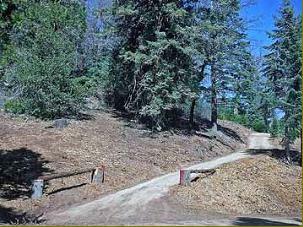 Great level access and parking, plotted road. Come on up and see if this is the one! 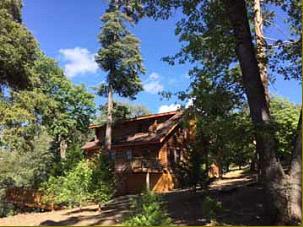 A 20% down conventional loan is available for this cabin. Scroll below for lender info. Sold before I put the sign up! Sellers gave me the keys but told me they wanted to do some painting first. Well, I couldn't resist when I had a client in my car, I just had to take him in.... 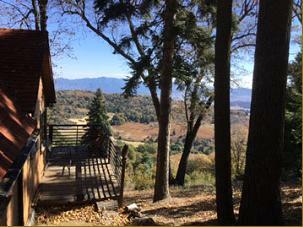 He couldn't resist looking out from his dining window and deck to the 575 acre Jeff Valley. It is soon to be National Forest so that will make a spectacular back yard! Cozy and comfy with so much charm packed into 548 square feet. It was built back in 1948 but has had lots of love since. New double pane windows and every inch is decorated to the max. Must be purchased with the Gazebo lot next door. With humble beginnings in 1927, a local contractor completely rebuilt and enlarged the cabin in 1993. 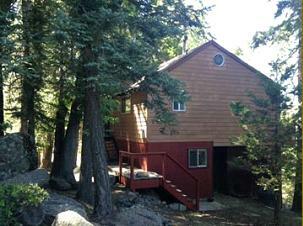 Lots of natural light with a deck looking out to very private, peaceful views, including High Point Fire Lookout. 2x6 construction, fully insulated, all new plumbing and electrical, double pane windows--quality workmanship! 598 sf on upper level with the kitchen, living area, a bedroom and bath. A ladder goes to a standup sleeping loft that is 26x9. Plus, the walk-out basement is 598 sf, too and could perhaps be completed to become a master bedroom. It has a half bath and wonderful area for a big spa tub around the boulders and someday stairs to the living area… So many possibilities! Available with Honeymoon Cabin, next door, or as a single purchase. 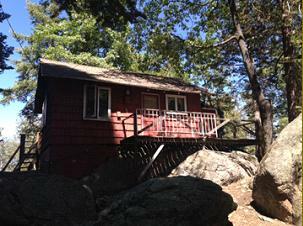 Climb the stairs to this charming cabin-on-the-rocks. It was said to have been built by 20 cowboys, in 3 days, for a honeymoon! They built it in 1924 with lots of love but 92 years later, this single-wall cabin could use another dose of your love and attention. Cozy in front of the wood stove when the snow is falling. 370 sf with one bedroom plus a Murphy bed and a kitchen and bath. Beautiful view off the back deck. Phone, internet and water. But, that's not all!!! Another 'Shabin', named after the seller is waiting out back. "Bob's Bunk", is 12x14 with a wood stove. Just wait until you see the outside shower!!! Ohmygoodness! Are you a cash buyer? Come up and see! Available with Crow's Nest, the cabin next door, or as a single purchase.